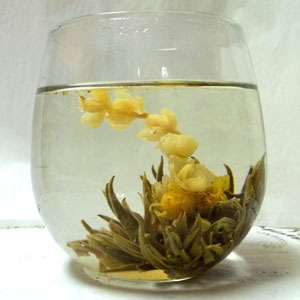 Flowering teas, also know as Artisan, or Blooming teas are an ancient art form. 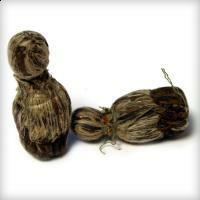 Premium leaves are hand-wrapped around flower petals, tied with cotton thread and formed into various shapes. As they steep they unfurl in the hot water, and a beautiful flower appears to bloom before your eyes! 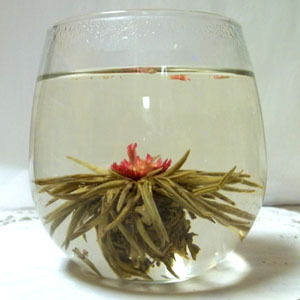 To brew them it is best to use a heat-proof transparent vessel, so that you can see the full beauty of the transformation. Fill the vessel with steaming hot water, and gently place the tea into the water. Be patient- touching or turning the tea will result in broken leaves. Let it steep for as long as it takes for the tea to turn into a work of art! Each blossom makes 4-6 cups of tea. 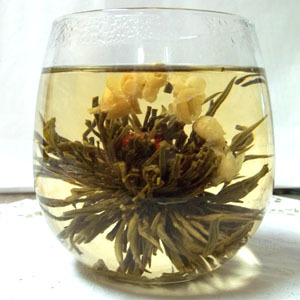 A beautiful flowering green tea with lychee..